We all want to have what suits to our needs and to our budget when it comes to home appliances. And though, there are tons of brands out in the market that offers these things - no one could stop us from getting the best value of our hard-earned money. Last Saturday, at the biggest expo defining the landscape of building and construction in the country for over two decades, 2018 PhilConstruct exhibit at the SMX Manila in the Mall of Asia Complex, Pasay City, I had a chance to be introduced to one of the trusted brands in the global market when it comes to cooling system - GREE Air Conditioner. Together with the industry’s movers and shakers, hundreds of the leading suppliers and thousands of trade buyers are gathered to offer their top-of-the-line innovations, GREE Air Conditioner shares their latest line of products that will bring comfort and convenience to every business and household in the country. Mr. Geraldo Manalo, GREE Air Conditioner's Commercial Sales Director, shares that GREE Air Conditioner has been in the Philippines for 15 years, through the distribution of Filipina Climate Solution, Inc. Noted as one of the top suppliers of cooling systems for big companies not only in the country but also in the world, GREE Air Conditioner started making waves in the Chinese market, where it originates, and currently being one of the sought-after brands in the Western countries, specifically in European countries. On my visit at the PhilContstruct 2018, I learned how wide their product lines is and how advance. They even have some products that promotes sustainability, which is an in-demand product line in Europe, including the latest GREE GMV5 Home. GREE GMV5 Home, which is highlighted in the exhibit, showcased its 5 basic modes: Wide Range of Operation Condition; Auto Heat Recovery in Cooling; 3D Heat Supply Technology; All DC Inverter Technology; and Intelligent Water Tank Defrosting Technology. Aside from that, GREE also boasts its GREE CROWN Series, which is consisted of The U-Crown Split Type Inverter and the I-Crown Floor Standing Type Inverter. These air conditioners feature WIFI Technology with 20% less noise comparing to conventional. These products already used refrigerant R410A that has almost 0% effect in depleting the ozone layer. 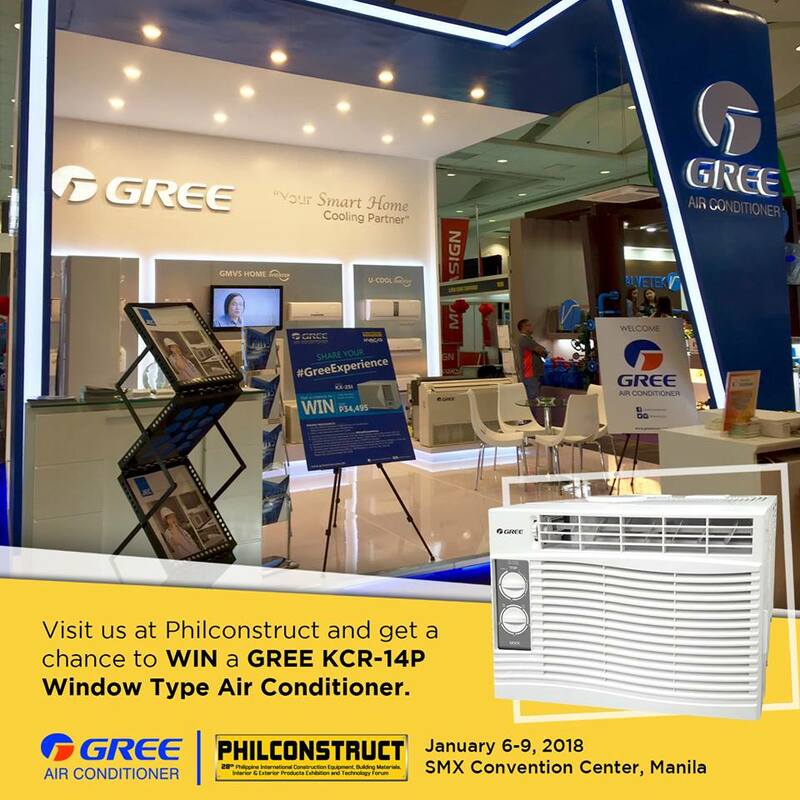 To know more about Gree Air Conditioner, you can visit their booth from January 6 to 9 at the 2018 PhilConstruct. This event is organized by the Philippine Construction Association, Inc. (PCA), the leading organization in building and construction whose members are responsible for over 70% of all construction projects in the country. Lucky visitor can get a chance to win a brand new air conditioner. You can also visit Gree Air Conditioner's Facebook and Instagram to know more about their products and latest news. You can also visit PhilConstruct website at http://www.philconstructevents.com for more details about the event.